Familial chylomicronaemia syndrome (FCS) is a rare, inherited disorder characterised by impaired clearance of triglyceride (TG)-rich lipoproteins from plasma, leading to severe hypertriglyceridaemia (HTG) and a markedly increased risk of acute pancreatitis. It is due to the lack of lipoprotein lipase (LPL) function, resulting from recessive loss of function mutations in the genes coding LPL or its modulators. A large overlap in the phenotype between FCS and multifactorial chylomicronaemia syndrome (MCS) contributes to the inconsistency in how patients are diagnosed and managed worldwide, whereas the incidence of acute hypertriglyceridaemic pancreatitis is more frequent in FCS. 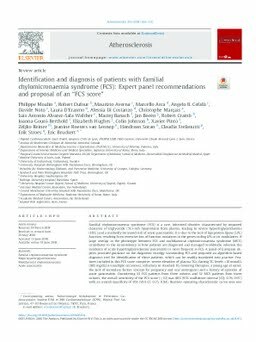 A panel of European experts provided guidance on the diagnostic strategy surrounding FCS and proposed an algorithm-based diagnosis tool for identification of these patients, which can be readily translated into practice. Features included in this FCS score comprise: severe elevation of plasma TGs (fasting TG levels >10 mmol/L [885 mg/dL] on multiple occasions), refractory to standard TG-lowering therapies, a young age at onset, the lack of secondary factors (except for pregnancy and oral oestrogens) and a history of episodes of acute pancreatitis. Considering 53 FCS patients from three cohorts and 52 MCS patients from three cohorts, the overall sensitivity of the FCS score (≥10) was 88% (95% confidence interval [CI]: 0.76, 0.97) with an overall specificity of 85% (95% CI: 0.75, 0.94). Receiver operating characteristic curve area was 0.91. Pragmatic clinical scoring, by standardising diagnosis, may help differentiate FCS from MCS, may alleviate the need for systematic genotyping in patients with severe HTG and may help identify high-priority candidates for genotyping.